Once the mince pies have lost their appeal and the turkey is gone the one thing left to remind you of a good Christmas is your real tree. But what to do with it once the festive period is over and the needles are starting to drop? 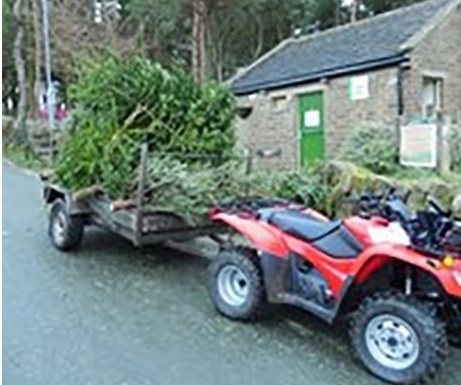 Have no fear as you can recycle your Christmas tree at Ogden Water. Each year Calderdale Countryside Services receive thousands of trees, some that have their roots cut off and others potted. No matter what the state of your tree they can use it. Trees can be left outside the visitor centre/classroom and then a hardy bunch of volunteers work the trees, removing branches down one side and placing the cut trees into a brash layer surrounding the reservoir. This thick layer adds a dash of colour during January, but has a number of other advantages. The layer prevents anyone from accessing the water – helping to keep people safe while still enjoying the site. It also creates a habitat that is used by birds, mammals insects and plants to breed, grow and develop over the coming year.